This autumn, we’re investigating the Arthur’s Seat coffins and their link to the crimes of William Burke and William Hare. The National Museum of Scotland is not the only Edinburgh institution with a connection to the murderous pair. In this guest post, David McLeod explores their story through objects preserved in the Surgeons’ Hall Museums collection. William Burke was executed on January 28 1829. As punishment for his crimes he was publicly dissected by the anatomist Professor Alexander Monro (tertius) at the University of Edinburgh. Grisly souvenirs started to appear in Edinburgh, with books and wallets made from Burke’s skin being sold on the streets. A pocket book made from Burke’s skin is on display at Surgeons’ Hall Museums. This particular object serves as a reminder of the crimes that took place. The murders carried out by Burke and Hare generated such an outcry of anger that the dissection of Burke and the public display of his remains seemed a fitting punishment for his crimes. 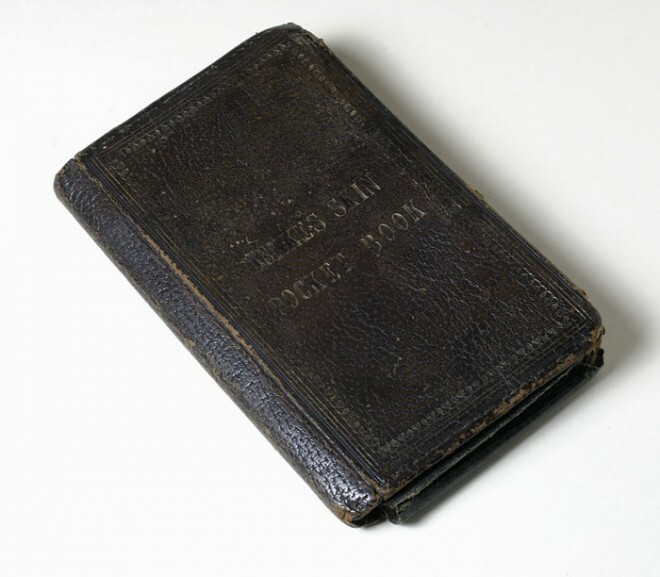 Pocketbook made from skin of William Burke © Surgeons’ Hall Museums at the Royal College of Surgeons of Edinburgh. The Museums are also home to William Burke’s death mask. 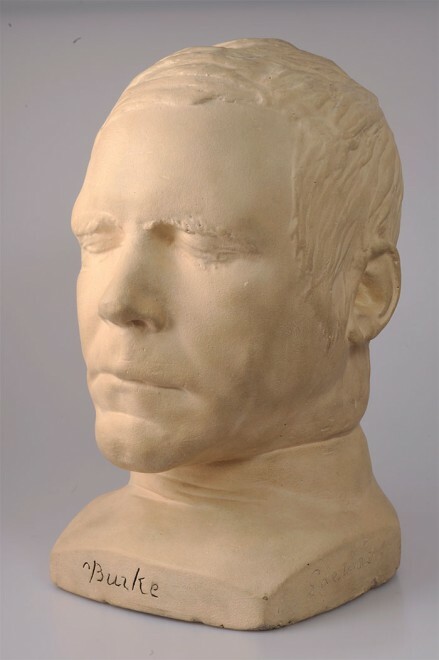 After execution, a cast was taken of William Burke’s head. As you can see in the image below, there is an indentation on the side of neck of Burke. This is where the rope pulled at his neck when he was hung. Death mask of William Burke © Surgeons’ Hall Museums at the Royal College of Surgeons of Edinburgh. William Burke and William Hare are synonymous with Edinburgh, and the West Port murders, as they became known, have gone down in history as the most notorious murders to take place in 19th century Scotland. Burke and Hare were responsible for the deaths of 16 people in Edinburgh. The murders were carried out during a period when anatomists and medical students were desperate for a constant supply of bodies for dissection and cadavers were a scare commodity. Grave robbing (or ‘bodysnatching’) had become a serious problem, not just in Edinburgh but throughout the country. Burke and Hare, however, looked beyond grave robbing. In 1827, after a man died owing Hare money, the pair discovered that they could sell his body to one of the city’s anatomy schools. At this time, Alexander Monro tertius was the Professor of Anatomy at the University of Edinburgh, whilst Dr Robert Knox was curator of the Museum at Old Surgeons’ Hall, having been appointed to the role in 1825. Caricature of Robert Knox © Surgeons’ Hall Museums at the Royal College of Surgeons of Edinburgh. Burke and Hare were prompted to take the body to Robert Knox, and they received the sum of £7.10 shillings for this fresh cadaver. Throughout the next year, Burke and Hare embarked upon a killing spree – sometimes together and sometimes acting alone – murdering their victims by suffocation; sitting on their chests and applying pressure to the lower jaw. This would be known as “burking”, and it continued until both men were caught in November 1828. Following a trial, Hare turned King’s evidence against his partner in crime and was granted immunity, while Burke was executed on 28 January 1829. Burke’s execution on the Lawnmarket was a very public affair, and a crowd of around 20,000 gathered to watch his hanging. Burke was dissected by the anatomist Professor Alexander Monro (tertius) at the University of Edinburgh, and his skeleton was displayed there as a brutal reminder to those who dared to carry out similar crimes. 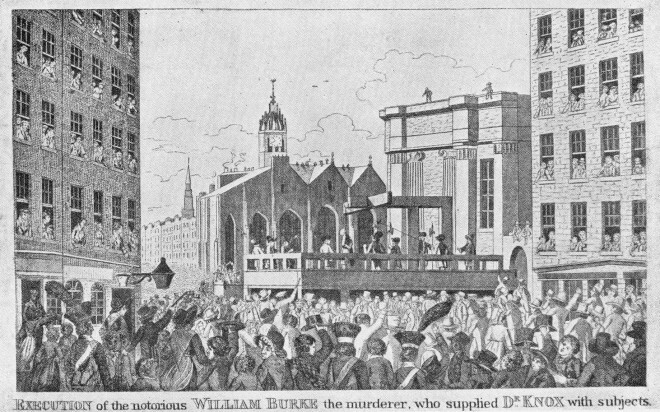 Execution of Burke in the Lawnmarket. 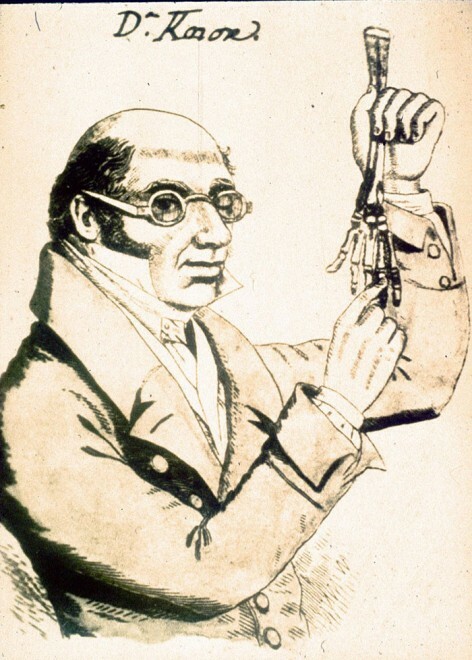 The crimes of Burke and Hare and the activities of grave robbers paved the way for the Anatomy Act in 1832. Prior to this, the supply of bodies was maintained principally via bodysnatching and grave robbing. Burke and Hare’s case illuminated this illegal trade, and the consequent public outcry instigated change. Progressions in medicine were advancing at such a rate that demand was outstripping supply, so the Anatomy Act aimed to address the shortage by ensuring that unclaimed bodies (typically paupers) or those that were donated by relatives could be used for the study of anatomy and medicine. Surgeons’ Hall Museums is open seven days a week from 10am – 5pm. Admission is £6 for adults; £3.50 for concessions. More information about the Museums, its collections and upcoming events can be found on its website http://museum.rcsed.ac.uk. You can read our investigation into the mystery of the Arthur’s Seat coffins here. Just reading Ian Rankin’s Rebus novel, The Falls. Some very interesting background information here. A couple of corrections – it is ‘hanged’ instead of ‘hung’ and it is £7 10 shillings or £7 and 10 shillings instead of £7.10 shillings. I hope you don’t mind. Very interesting exhibits and facts were presented.